Technology is making its way into every aspect of our everyday lives, making it difficult for us to choose between devices because of the infinite options we have. When it comes to refrigerators, it is not the same as it was twenty years ago. Now, we don’t only choose a refrigerator that can freeze our food and water, we want one that matches our kitchen décor and offers the most modern features available within our budget. With millions of options on the market it’s hard to make the right choice. That’s why we wrote a useful buying guide with refrigerator reviews and present what we think are the top 10 refrigerators in 2019 (skip to see our top brands and model recommendations). We also include what it is that really makes for a top rated refrigerator and which of the best refrigerator brands may be right for you. Which One Will Be The Best Fridge For You? This type is similar to a bottom freezer. The only difference is that these types tend to have double doors, with two top refrigeration sections that come with two separate doors. The advantage is you only open part of your fridge when you access it. The smaller door needs less space to swing open as well so it gets an extra point for convenience. 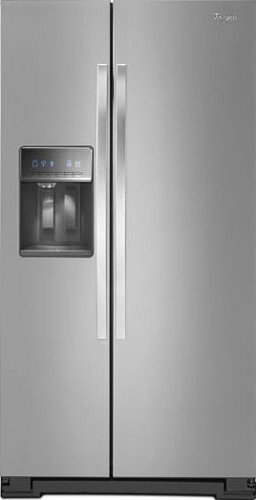 These refrigerators usually offer more space than top- or bottom-freezer models and often have water and ice dispensers in their doors. This kind of refrigerator also has two doors, with the fridge on one side and the freezer on the other. It is typical that the freezer side is a bit smaller than the refrigeration side. Larger families tend to use this type because they offer more cubic feet overall while still fitting in most kitchens. They are usually in need of storing larger quantities of food in the freezer, but a big complaint here is that the freezer space fills up quickly and doesn’t offer enough room. It’s important to note that these options are also not as energy efficient. This can definitely make a difference with your electric bill over time. These are the traditional fridges we all know. They tend to have a lot of storage in the bottom part and offer some decent space at the top for freezing. They are typically 30-inches wide and can store lots of food products inside, but features and reliability do vary from brand to brand. A freezer-on-top model is also very energy efficient, making it a good choice as an extra fridge in the garage or basement. They usually provide just the basic features so you don’t have to worry about breaking the bank. And while they’ve become less popular over time, they no doubt offer great dependability. These are often less spacious than the top freezer type; however, it all can vary by model and brand. Bottom freezers are usually more user friendly because you can access the freezing shelves more easily. This is because you can reach down into a “bucket” style compartment. Frozen food can be stacked within interior drawers for even more convenience. Often very large and spacious, these types come with lots of cabinets, shelves and different features that can vary among models and brands. You’ll find this with French doors or some styles offering up to four doors. 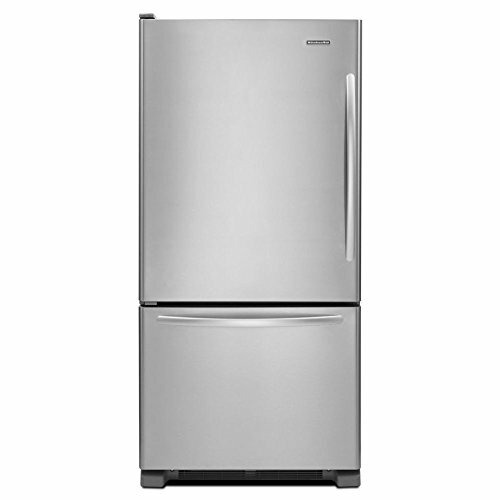 They are typically good-sized appliances with up to 25 cubic feet capacity and offer a variety of freezer styles. This is the perfect option for small houses, apartments or dorm rooms. You see them work well in offices and of course, in nicer hotel rooms. They work best as secondary fridges more than everyday ones. One issue is they can sometimes have temperature regulation problems, which can lead to bacteria or mold issues inside. They are usually less than half the price of a basic, regular sized refrigerator. Only some models have a freezer but it tends to be really small. When you’re looking for a refrigerator to fit with your necessities and desires, it is always a good idea to compare refrigerator brands. Find ing out who is the most trusted and what refrigerator brands to avoid is a great first step. This will help you in understanding better models, the one which offers the best features from storage capacity, temperature control and efficiency. However, it is not an easy task to choose the perfect refrigerator, that’s why we have taken our time to research and uncover just what makes these brands great. We’ve compiled exhaustive information from basic specs, sales and maintenance history, to user input so we can present the best refrigerator is by its style, brand and it’s performance and reliability record. It’s always important to know that everything depends on the model – some brands have great top-freezers and others produce amazing French door type models. It’s what makes choosing a fridge so hard…yet so awesome, because it means there’s truly a perfect unit out there for you. 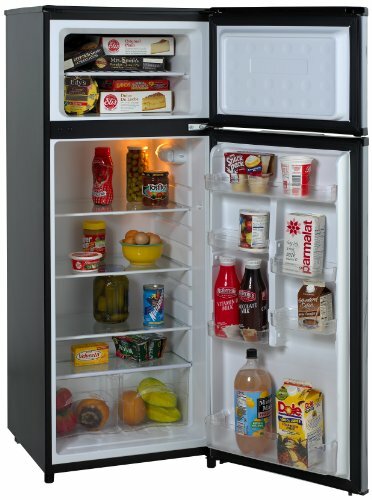 This is one of the most common and popular refrigerator styles sold today. If you value space efficiency and helpful added features you’ll agree. The best brands to look out for when shopping for these stylish and versatile refrigerators are Samsung, GE, LG Electronics, Whirlpool, KitchenAid, and Maytag. However, the brand that steals the show with the most popular and best-selling model is Whirlpool. This is durability, quality, and value all in one machine. The Whirlpool 24.5 cu. ft. French Door Refrigerator in Fingerprint Resistant Stainless Steel (See Model #WRX735SDHZ for more info), is one of the best fridge brands to buy for its price and abundant features. You can also see our Top-5 choices for French doors below. Around 35% of people who buy refrigerators will choose this type thanks to the greater storage space and the really ample vertical freezer. You’ll find GE, Whirlpool, Samsung and Frigidaire having leading models for this style. All offer excellent features and quality, but GE is the easy stand-out in this category. For side-by-side models, we highly recommend the ever-popular GE 25.3 cu. ft. Side-by-Side Refrigerator (See Model #GSS25GSHSS for more info), which has all the right features you really need and at a price you simply can’t beat for what you get in a modern fridge. Its value is “wow” good. Customers who desire a simple and traditional style will select the classic freezer-on-top setup. This basic design uses storage space very efficiently despite being comparatively smaller, with sizes ranging from 7 cu. ft. to 22 cu. ft. in storage space. The most trusted brands for these models include Frigidaire, Whirlpool, Maytag and GE. Hotpoint and Haier are honorable mentions as well. Our favorite top freezer brand is unquestionably Frigidaire. They’ve been the most reliable refrigerator brand the longest. We highly endorse their top-selling model: The Frigidaire 18 cu. ft. Top Freezer Refrigerator (See Model #FFTR1814TW to see why). This is a solid basic model that is built around convenience with the reliability of a trusted brand. It comes with over-sized door bins for easier storage of bottles and jugs, strategic lighting placement to see inside better, and adjustable shelves for your preferred custom configuration. Bottom-freezer fridges are one of the most popular types purchased worldwide. They tend to be more simple but soar in the convenience category with their easily accessible bucket-style freezer compartment and a fridge space that sits mostly at arm level. LG, Whirlpool, GE and Maytag are the front-runners when it comes to the best brands for bottom-freezers. There is one that blows away the competition though, and it’s Whirlpool again impressing us… and hundreds of thousands of consumers alike. You can call it no-frills or just awesome simplicity. The Whirlpool 22 cu. ft. Bottom Freezer Refrigerator (See Model #WRB322DMBM for details) is everything when it comes to refrigerator performance. It does what a fridge is supposed to do better than most units out there of all types. It keeps all areas of the interior consistently cold so your food stays fresher longer. It may not be loaded with expensive features, but if you want efficiency and the freshest food, this machine is easily the best. When we talk about compact and mini refrigerators, we mean the kind of refrigerator that is specially made for small spaces. There are hundreds of models, but the best ones come from two brands. The first one is the Danby DAR026A1BDD-3 Compact Refrigerator, which offers great features like a small freezer, energy star compliance, scratch-resistant top and tall bottle storage. This model comes in sizes starting at 1.7 cu. ft. and goes up to 4.5 cu. ft. of storage space. The other one is the Midea WHS-65LB1. Th Midea is your true mini-fridge. But it does the job really well. It’s small size of 1.6 cubic feet is a little smaller than Danby’s smallest offering and also doesn’t come with a freezer. For a small or single office, game room basement or man cave in the garage, this will fit in conveniently and keep your favorite drinks, leftovers, snacks or lunches chilled. These refrigerators are often used in big kitchens or other areas where space is available. They are specially made to store a large amount of food and other items. They have little energy efficient technology but offer great temperature measures and at the same time, keep all food fresh and stored efficiently. Top brands for built-ins include KitchenAid, Fisher-Paykel, Electrolux, Frigidaire, and GE with their Profile line. It’s pretty easy to see that KitchenAid doesn’t mess around when it comes to producing built-in appliances. It’s 25 cu. 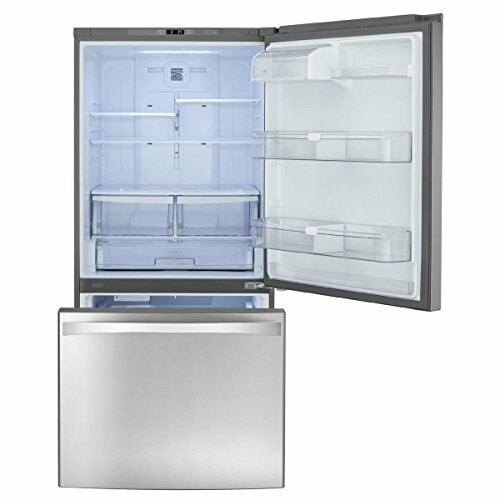 ft. Built-In Side by Side Refrigerator (See Model #KBSD602ESS4) will give you the cavernous storage space you need with dependable ice and water dispensers you’d expect from a professional grade refrigerator. 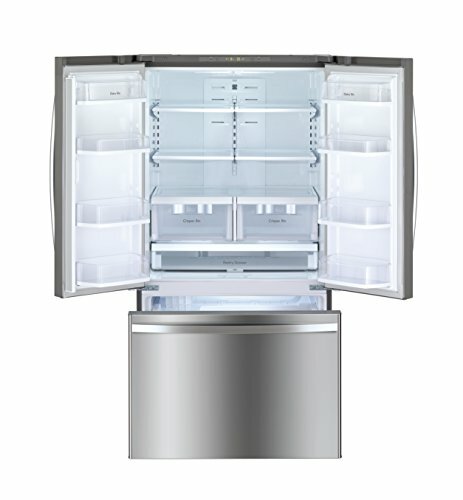 As a full-size fridge, this model is a wonderful alternative to the popular Sub-Zero brand, and at a lower cost. 1. Whirlpool WRX735SDHZ 24.5 cu. ft.
3. LG GFE26JSMSS 26.2 cu. ft.
4. GE GFE26JSMSS 25.6 cu. ft.
5. Frigidaire FFHB2750TS 26.8 cu. ft. If you want to buy a new fridge for your home or your workplace, you’ll want to follow and analyze the following features on every refrigerator. The size of a fridge will not only tell you if it fits where you want to use it, it also tells you what kind of door mechanics it has and how much storage space it can have. It is recommended to choose the most complete and spacious appliance, with cubic feet ranging from 30 to 33. This refers to the amount of time a refrigerator takes to decrease to -0 degrees Celsius or 32 Degrees Fahrenheit. The faster the fridge does that, the better chance that it will maintain all your food fresh and in great condition overall. It’s an important factor that a refrigerator has a good temperature range. You’ll see this factor come up in most refrigerator reviews. The temperature must be consistent the whole day without any interruption in order to maintain all the food inside the fridge keeping it fresh and consistent. This is one of the most important features because a refrigerator needs to be capable of maintaining a temperature between 37 and 0 Degrees Fahrenheit in order to always keep food properly fresh. It is Important to take into account that a refrigerator shouldn’t have temperature swings unless it loses its power for a long period of time. A helpful feature some modern refrigerators have is to selectively alter the temperature in different compartments based on the type of food being stored there. These types can even have sensors to automatically detect food and adjust temperatures accordingly. This factor refers to the amount of freshness and consistency the appliance has while freezing and maintaining the temperature of the whole device. The more humid the refrigerator can stay without exceeding the limits of normal humidity, the better your food will preserve its taste, nutrients and freshness. Also, another important thing to take a look into is, if the shelves and drawers are customizable and can be adjusted when it comes to their position, length, and width. this refers to the amount of power the appliance uses over time. It is really important to choose a refrigerator that uses little energy because they are always on, so the less energy they consume, the better. The storage space of a refrigerator means the amount of space and features it has to store more and more stuff. A lot of these products have drawers, shelves, deep storage to save different food, and water storage. This refrigerator is one of the most spacious refrigerators for its size. It is really efficient and has features such as the SpaceWise. Perfect for those looking for a lot of storage space and efficiency. Its design is really good; it comes in white or gray, depending on the user desires. It offers different baskets and drawer options that allow you to organize items efficiently. It has a Frost Free feature that lets the food inside stay frozen for longer periods of time, very useful in case your power is turned off for some reason. A great refrigerator for anyone in search of space and high performance. 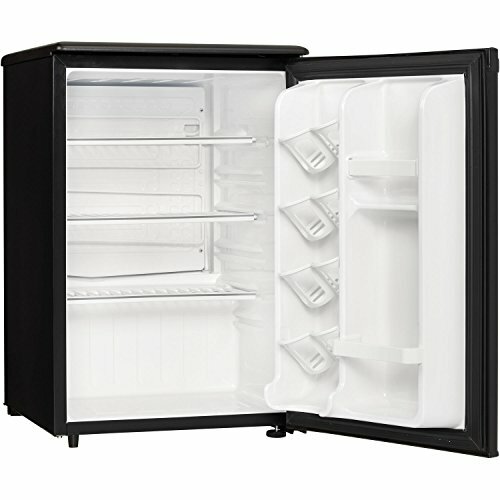 This is a compact mini freezer and refrigerator with a great cooling feature and performance. This refrigerator comes in three different colors and it’s very energy efficient with a wonderful design. For being just 4 Cubic feet it is still very spacious, with great storage features like a can disposal and a space for tall bottles. Its performance is so good that it can freeze any kind of product that fits into the freezer in just 2 hours, something that not many refrigerators do, especially small ones. 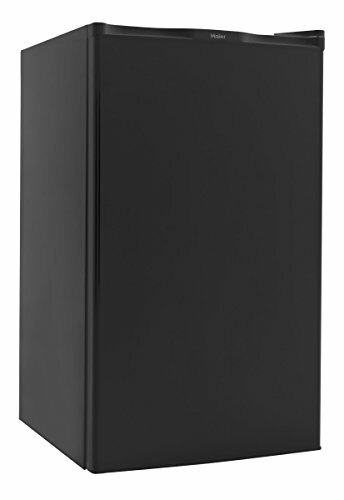 This great refrigerator does a great job for the little energy consumption it has. With a great performance, this refrigerator doesn’t demand much energy, while maintaining all your food cool and fresh at all times. Being an apartment-sized refrigerator doesn’t make it less efficient. Just like the previous one, this refrigerator can be modified and adjusted to achieve more storage. However, the only problem many users face with this refrigerator is its design and the materials it was made with. Many users say its interior design doesn’t work too good, as the freezer ice can sometimes get to the bottom part of the fridge and form water deposits that can be really annoying. However, a great and affordable option for the average user. This refrigerator is not the biggest on the market, but being an apartment-sized refrigerator doesn’t make it less valuable. 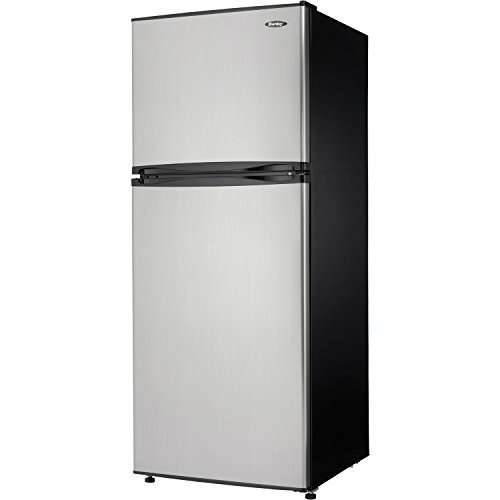 With great looks and design, this fridge is made of stainless steel and its very energy efficient. Inside it has bright LED lights which makes it really wonderful as it lets you see easily through all their crystal made drawers and shelves. Fits well in any sized kitchen and space. Its top freezer does a great job at freezing products, its temperature can be modified to fit your needs. Has electronic controls and an indication display to change everything from temperature to the way it cools. It has shelves that can be adjusted and removed if desired. This refrigerator is one of the largest available. With a lot of storage space and with a quality performance that can’t be met by other of its kind, this great fridge does his work awesomely. Specially made for big kitchens or places where it is needed to have a lot of space to store different products, this refrigerator will do a great work at keeping all your products fresh and cool, without temperature variations. The best feature about is the easiness of organization it provides; this refrigerator is so well designed that it won’t let you have disorganized products inside. Also, it comes with fabulous LED lights that will let you find anything. Top choice for larger families and bigger kitchens. This wonderful refrigerator is one of the best in its kind. It maintains food and any product really cool and fresh inside, with no temperature variations as it has a sensor that helps it to stay always at the right temperature. With really nice additional features like the water dispenser filtering, this refrigerator does a great work with ice making and water dispensing. Also, it doesn’t consume too much energy. The best thing about this refrigerator is its design, made of stainless steel and wonderful LED light inside; offers super storage, is extremely quite and allows for very good food organization thanks to the way he shelves are placed. This Mini-refrigerator with 2.6 cubic feet and one door is one of the best of its kind. It will keep all your food and drinks really cool and fresh inside, with a really energy efficient technology that makes it a really nice option. It also has a chiller compartment that works as a freezer so you can store products you want to stay cooler or very cold. It has a can dispenser and is made of stainless black steel which gives it a great design overall. It can be installed anywhere, from a garage to an office and even a small dorm room and it will do its job perfectly, with a nice temperature and enough space inside to store enough products. The best thing about this mini refrigerator is that you have a great temperature consistency. This makes it a really great choice for someone in search of a compact refrigerator to fulfill all his needs. This refrigerator has a great temperature consistency and doesn’t get affected by external temperature changes that could affect the fridge internally. However, its compressor works almost always and that can get really noisy and consume a lot of energy and be inefficient. It's less less space efficient than other options on this list, but can still be modifiable if drawers and such are removed from the appliance. The best feature is its water dispenser and ice maker. It's a self-reload feature that is easy to use and pretty efficient. 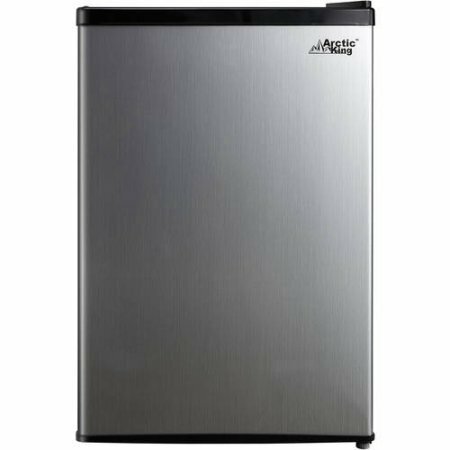 With great temperatures and great additional features like the ice maker and water dispenser, this refrigerator is a good choice; unless you think that power saving is actually more important. This Side-by-Side stainless steel refrigerator has a wonderful temperature system that maintains food in a perfect state at all times. It has a great temperature sensor that changes the temp of the inside by adapting it to the one on the outside and activating its compressor when it gets too hot. Really good looking refrigerator but doesn’t have an energy efficient build-up. It can be really energy demanding when its compressor works. Space won’t be a problem with this refrigerator, as it has an exterior dispenser for water and ice and internal shelves and drawers that can be modified to allow for more storage space. Doesn’t make much noise unless its compressor is working, but even in that case, the noise won’t be tedious. However, the performance is so great that you won’t believe how fast it can freeze or cool your products. 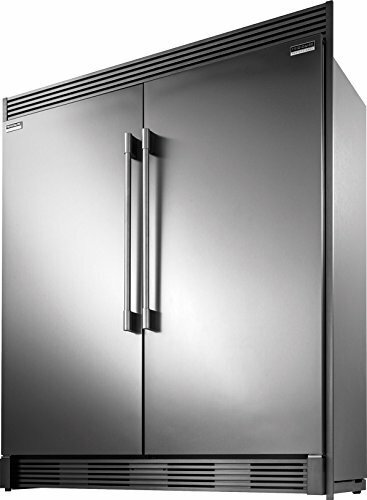 This bottom Freezer Refrigerator delivers the besr temperature performance. It keeps optimum temperatures in both the freezer and the fridge and within each compartment inside the fridge. It doesn’t change temperatures if the room temperature changes. It has a good humidity level. It doesn’t consume too much, however, if it is used at its maximum, the consumption can increase and this may well affect your bills. It doesn’t make too much noise when used. When it comes storage space, there’s nothing bad to say about it. Shelves are organised well and can be modified and the freezer features pull-out baskets for easier use and access. Many people now-a-days assume that when we store food in the refrigerator that it is the best way to keep it safe from bacterial contamination. Unfortunately, it’s just not that easy. There are so many types of bacteria that can grow in cold temperatures that we aren’t even aware of. Even though most bacteria grow best in hot temperatures, there are still some that flourish in cold environments. These types of bacteria are called psychrophilic and are known to grow in temperatures ranging from 14º Fahrenheit to 68º Fahrenheit. These bacteria can grow in these low temperatures because they have an enzyme that enables them to. Psychrophilic bacteria are identified as Pseudomonas, Listeria, Vibrio, and Coliform. All of these are very harmful bacteria and can potentially cause serious ill effects in people. These serious illnesses include dysentery, diarrhea, meningitis, sepsis, food poisoning, urinary tract infections, and gastrointestinal infections. In this section, we will discuss different ways to help you prevent the spread of bacteria in your refrigerator. The refrigerator is fundamentally one of the main storages we use for our food. The fridge also helps prevent and slow down spoilage. That said, there are still some types of bacteria that are capable of flourishing inside the refrigerator. Below you will find a list of tips to help you keep a bacteria-free refrigerator! One of the most crucial things you can do with regularity is to clean your refrigerator. If you make a routine of this, it’s the best safeguard against bacteria forming and growing in your cold food storage. Clean as you go definitely applies here too. For example, if you accidentally spill some food in your fridge, immediately wipe it up to avoid any growth or spread of bacteria. It is also important to use anti-bacterial cleaners or even bleach to clean the surfaces of your fridge. If chemicals aren’t your thing around the stuff you eat, you can use hot soapy water to clean and rinse it thoroughly. It’s a good idea to throw away old and spoiled foods. These foods can cause growth and spread bacteria, as well as molds, which has the potential to contaminate other foods. In fact, don’t wait until the food has gone bad. In most cases, food is no longer safely edible before it even shows signs of being spoiled. Make a rule for cooked meat and other left-over meals. In most cases, once 5 days comes and goes, it’s time. Make a chart to keep track if you have to. Or, at least keep a good mental note of when it’s time for things to either be eaten or tossed. Perhaps in your compost pile? Remember, investing in the best refrigerator you can afford will help as the ideal temperature ranges are kept more regular, helping to save your food longer. Your foods should be stored in tightly-sealed containers. This guarantees that your food preserves its moisture and prevents any bacteria from spreading to other foods that is being stored in your fridge. You should NEVER mix raw foods with cooked ones. Raw meat, poultry, and fish contain several bacteria. Raw meat can cause severe issues from food poisoning to salmonella poisoning. To prevent any contamination, make it a regular habit to place any raw meat on the bottom shelf of your fridge. By doing this, you are making sure to avoid any juices dripping down from meats into other foods, causing contamination. Another tip is to just use some extra meat plastic bags from the grocery story to transport, handle and store your meats up until you’re ready to cook. Keep those raw juices contained! Another useful tip when keeping a bacteria-free refrigerator is to make sure that it is set at 40º Fahrenheit or lower. A temperature range of 34º-36º is the ideal temperature to prevent and/or slow down the growth of most harmful bacteria. Many refrigerators you find on the market today come with a built in thermometer. This lets you view the current temp setting so you always know what your refrigerator’s cooling temperature is. If yours doesn’t have one, you can purchase an appliance thermometer. Another nice feature on a lot of models is the ability to temporary drop the temperature down. This is useful say when you come home from the store and are stocking your fridge. While the doors remain open during this time, the fridge loses a bit of its chill. A “grocery saver” option will get the internal temp back up more quickly to maintain the life of your food. Always make sure that your refrigerator doors are properly closed tightly. You also want to make sure that you do not open the doors more times than necessary because when hot air enters the cold storage of your fridge, you are supporting the increase of bacteria growth. Unless it’s freezing, harmful bacteria can live and grow in cold places, especially your refrigerator. It’s good to know what causes this bacteria and how to prevent it from growing to ensure your and your family’s safety. This bacterium, known as psychrophilic bacteria, is also known as pseudomonas, listeria, vibrio, and coliform. This type of bacteria is capable of causing many serious illnesses such as dysentery, diarrhea, meningitis, sepsis, food poisoning, urinary tract infections, and gastrointestinal infections. In order to greatly reduce the risk of contamination, it’s important to keep your refrigerator clean and sanitized. Cleaning your refrigerator with anti-bacterial cleaners or bleach will definitely help reduce the bacteria from growing and spreading in your refrigerator. It is also imperative that you throw away all old or spoiled foods because these foods grow bacteria as well as spread mold. Always make sure that you keep raw meats away from any other food in your fridge. You can do this by placing raw meat, poultry, and fish on the bottom shelf in order to prevent any juices contaminating your other foods. Always make sure to store foods in tightly-sealed containers in your fridge to ensure it keeps its moisture and prevent bacteria from spreading to other foods. Now-a-days, there are many refrigerators on the market that include multiple features and functions. But how do you know which ones are important for your lifestyle? Below, you will find the crucial features and functions a refrigerator should provide and what should be factored in for any refrigerator reviews you use to make a buying decision. Bear in mind that when selecting the options to include in our top 10 list, we took into consideration the criteria below. We made sure each of our top rated options offered suitable storage space, freezing, temperature range and features that would satisfy an average consumer as well as a more demanding one. 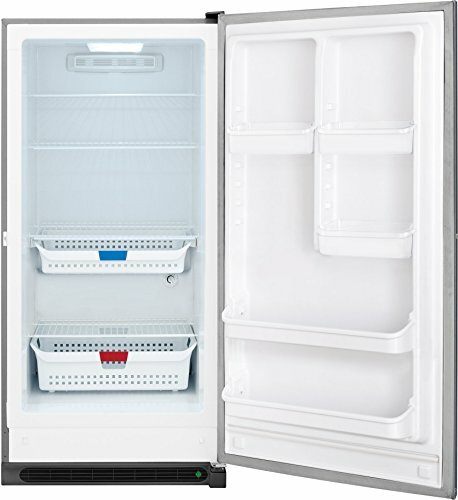 Top Freezer – This refrigerator has the freezer on top and the fridge below. 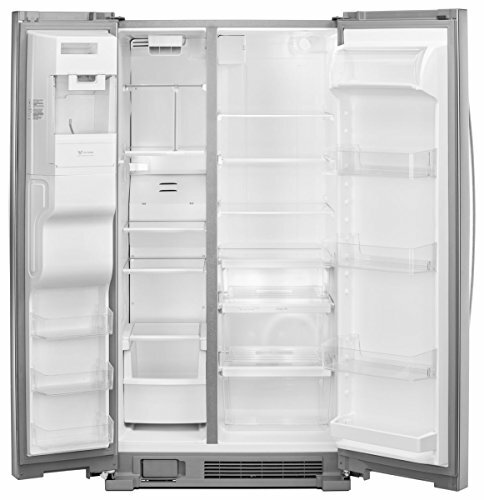 Bottom Freezer – This refrigerator has the fridge on top, while the freezer is below. 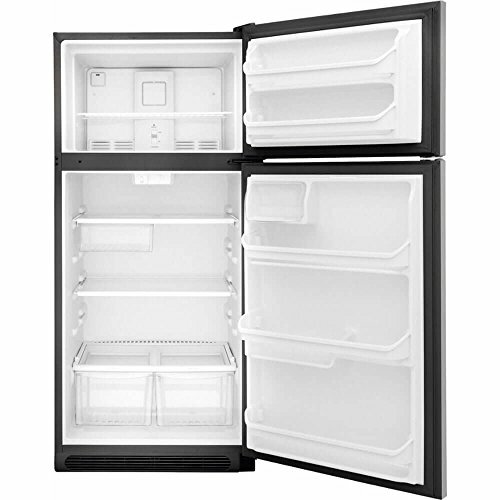 Side-by-Side – This type of fridge has two doors that open outward. The freezer and the fridge are positioned side-by-side. 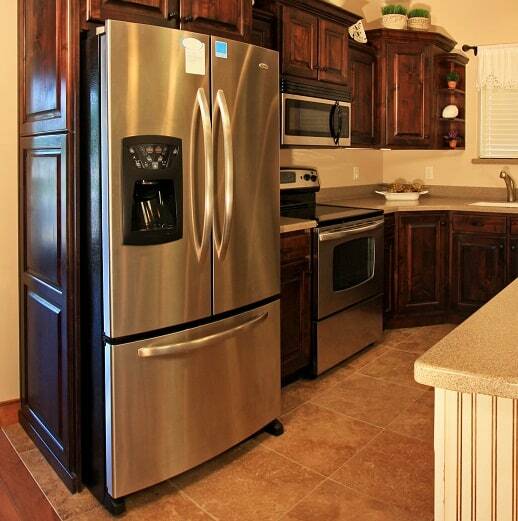 French Doors – This refrigerator has two doors that open outward, while the freezer is placed on the bottom. Before purchasing a refrigerator, it is imperative to figure out the dimensions of the space you will have to house your fridge. This way, while you are out shopping, you will know the height, width, and depth unit you will need to consider. It is also important to allow a few inches above and behind the appliance in order for it to circulate air. In order to make sure that you choose the best refrigerator for your needs, you should take into consideration the types of food you eat, how often you eat, and in what quantities. For example, if you are a person who purchases a lot of produce, then it would be wise for you to consider a model with multiple drawers. If you are someone who mainly eats frozen dinners, then you should consider something that will give you more freezer space such as a refrigerator with a big bottom freezer or a double door model that is half fridge, half freezer. Another factor to consider is if you are someone who drinks a lot of milk, juices, or sodas. If so, you may want to look for a double door unit with adjustable shelf sizes. This enables you to fit any sized beverage into any compartment. A unit’s freezing capability is the amount of time a refrigerator takes to decrease to a 0º Celsius or 32 º Fahrenheit temperatures. When you are looking at refrigerators, it is best to keep in mind that the faster and better consistency a fridge has with this factor, then the better chances the appliance has at keeping all of your food fresh and in great states overall. Every refrigerator must be able to accept different measures of temperature. The fridge also must be able to keep that temperature consistently 24/7 to ensure that all of the food inside will always remain fresh. This function concerns the refrigerator’s ability to keep foods fresh as well as the consistency of the unit while freezing and sustaining the temperature of the whole appliance. If the refrigerator is capable of keeping the interior more humid without surpassing the bounds of normal humidity, you will find that your food will be preserved better and stay healthy longer. It is very important to take into account the materials that your refrigerator uses because this will help you determine whether you are willing to take extra time cleaning the unit and so on. Generally, refrigerator shelves mostly come in two types; wire or smooth. The wire shelves are just rows of thin metal bars while the smooth shelves are usually made from glass or a hard plastic material or acrylic. Smooth shelves are the easiest to clean because you simply wipe the shelf down and you are done. Some units allow you to take the shelves out in order to hand wash some particularly stubborn stains, stickiness, etc. Wire shelving can be more complex to clean because it takes a little longer to do and requires a more detailed cleaning. The outside material is also important to consider. For example, if you simply cannot stand smudges, then you will want to stay away from stainless steel models. As such, you may want to consider a unit that has a white exterior or comes with a smudge-free finish. Look for models that mentions finger-print resistance. You definitely want to make sure that the refrigerator you’re considering provides easiness and compatibility with our everyday lives. For example, can you move the shelves around to accommodate certain foods or beverages? Are there ways to store items differently or modified in the fridge? This feature is a great asset to have in your refrigerator. These storage features include flexible bin dividers, adjustable shelves for oversized items, split shelves which can make room for tall items (such as bottles), and gallon door containers which frees up room in your fridge. This feature is great to have because it allows you to store produce at suitable humidity levels to ensure that they stay fresh longer. Enhanced lighting includes energy-efficient LED lights that are located over containers and in corners to make it easier for you to find what you need. Some top refrigerator brands like LG and their “InstaView Door-in-Door” feature allow you to see inside your well-lit fridge through a clear, see-through panel on the front door. This feature allows the best of both words – a way to easily see what you have in your fridge and the ability to do so without having to open the door an let out precious cool air. This feature is very useful because if the door does not shut all the way, then the door will either beep or chime. This helps prevent food and energy waste. You’ll also know when and if it’s time to replace the cam risers on the fridge hinges – these support the heavy doors and allow them to swing slowly shut into a tightly closed position. An alarm can go a long way to alerting you of this common problem. Even though these features are very useful to have, they can become a nuisance when it comes to maintenance. They will also boost your yearly maintenance costs. These features also make the fridge less energy efficient. The dispenser can significantly increase the cost of the refrigerator and also reduces storage space. This feature is capable of chilling two lukewarm cans of soda or one bottle of wine within eight minutes. A perk like this can cause your electric bill to increase though. This feature does nothing to help the performance of your refrigerator but rather, lends to a convenience factor. As with any smart appliance though, this is still a new way of operating and using these machines. What comes with expected convenience may come frustrations as even the best smart refrigerator can bring about issues during setup and with reliable connectivity. It may not be worth the extra hassle. The idea to have a television or a touchscreen with apps may sound interesting, but this feature really has nothing to do with how well your fridge will work. Going for an extended warranty can be a waste because appliances rarely break within the warranty time period. But if you still feel better purchasing it, then there is no harm in being cautious. Q: Which refrigerator styles are best for children? Side-by-side refrigerators are a great choice for children because the child is able to easily reach items in the fridge and freezer. This option prevents them from needing to stand on something, like a chair, to reach their desired food, and the high risk of falling. Q: Do compartment temperature and humidity controls really work? These controls have been tested and proven to work. A temperature control for the compartment to store the meat is capable of keeping the food fresh for longer. Settings for high and low humidity help extend the life of fruits and vegetables. Q: Are a water dispenser and an ice maker important? These are very useful features to have and are known to help out in the kitchen a lot. But as mentioned above, these features are also known to require a lot more repairs and make your unit far less energy efficient. Q: How can you tell which models are better at conserving energy? When you are considering a refrigerator, but do not know its energy efficiency, it is best to search for the federal government’s Energy Star Label. Appliances can receive this rating from the U. S. Department of Energy if the unit is significantly more efficient than the minimum government standard. You can also consult the Energy Guide label which tells you the model’s annual cost of operation at different utility rates. This label will also give you a quick estimate of yearly energy costs compared to other models. This question is difficult to answer because it depends on so many factors, and none more crucial than the appliance’s energy efficiency. Some models that have a great performance can actually have poor efficiency. Q: How cold should my refrigerator/freezer be? The thermostat for your refrigerator should always be set anywhere from 34º Fahrenheit to 38º Fahrenheit (around 2º Celsius). The ideal temperature in most cases is 37º, but can be set a little lower if you frequently open the door. The freezer thermostat should be set anywhere from 0º Fahrenheit to 5º Fahrenheit (-18º Celsius). Q: How much room do I need to leave behind my refrigerator/freezer? This depends on what type of refrigerator you have. If the fridge you are installing has condenser coils, which can look like a large black grid or even radiator-like coils, that are located on the back of the appliance, then you should leave at the very minimum about one inch (2 ½ cm) between the appliance and the wall. If your refrigerator has the coils locate beneath the appliance, then you can push it up against the wall if you would like. Q: What is the average life expectancy for a refrigerator before it needs to be replaced? A refrigerator has an average life of fourteen to seventeen years. Although, there have been some fridges that have lasted many more years while others did not meet the average life time of the counterparts. One way to ensure the longest lifespan for your refrigerator is proper cleaning and maintenance. Keep your coils free of dirt, pet fur, dust bunnies and grime. Buying a favorite model found in refrigerator reviews will not save you if you don’t perform regular maintenance. Q: Why does my food taste bad? What is the odor that is coming from my refrigerator? The reason foods and ice can have a bad taste or odor is mostly due to the fact that ice and uncovered foods can pick up odor or taste from strongly scented foods in the refrigerator or freezer. To prevent this from occurring, make sure to cover foods tightly and discard any old ice. If your ice tastes like plastic this is caused by plastic water lines. In order to get rid of this smell and taste, be sure to use the ice maker one to two times and making sure to use the entire ice container. This will surely get rid of the plastic water line releasing odors and/or tastes. After this, make sure to discard the initial container of ice after installing. Q: What is wrong with my ice maker? The answer to this question depends on what sounds the maker is or is not making as well as what the machine is or is not doing. For example, is your ice maker not making any ice? This can be caused from the freezer not being cold enough, the water supply valve can be blocked or restricted, the water valve may not be open, or the wire arm that controls ice production could be in the on position. Another problem that you could face would be the icemaker not turning off. If this is the case, before you call for service, make sure that there is not a piece of ice stuck on the wire arm control that is preventing the ice maker from turning off. If you have already tried this and have taken out the ice container and inspected the whole machine, but still have not found the cause, then you may want to consider calling a repairman for service. Q: Does my refrigerator need annual maintenance? The short answer is yes. Your manufacturer should have included a product manual that includes maintenance tips. Q: What are the best buying tips for purchasing? One thing to keep in mind is that refrigerators with an upper freezer compartment consume less energy. Another useful tip to remember while shopping is that refrigerators that have features like an ice and water dispenser consume too much energy. 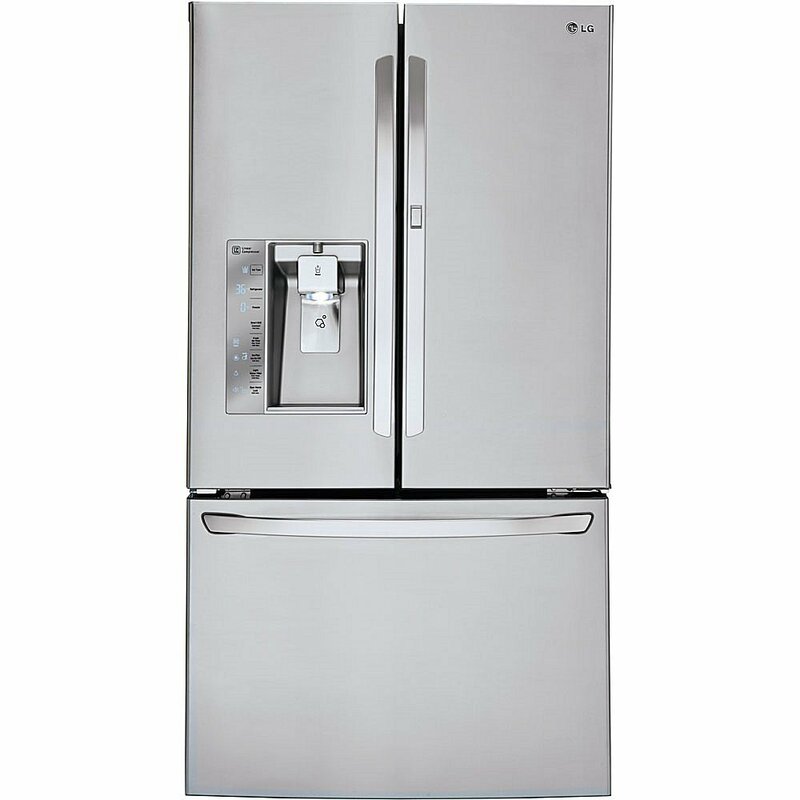 Lastly, always make sure that the refrigerator you are considering has an Energy Star sticker because this means that this unit surpasses the minimum government standard. Q: How are refrigerators rated? When looking for a refrigerator, make sure to look for Energy Star models and make sure to pay attention to the Energy Labels. It is crucial that you compare the information on the labels and take into account the kilowatt hours per year consumption for different models. You will find that the qualified appliances use 70% or less of electricity than most other models that are not qualified. Decision Time – Which Refrigerator Is The Right Option? When we talk about refrigerators, we have to make a great decision, as these appliances can improve our daily life or just make it worse. To simplify, there are a few things to take into consideration before making the model choice. The price says a lot about the efficiency and performance a refrigerator can guarantee. 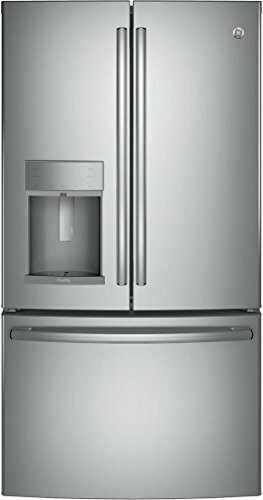 But the most important thing is to know if the price of a refrigerator os consistent with its features and size. The features of a refrigerator are not only its design and additional add-ons like the water dispenser or ice maker. If you want to choose a great refrigerator you’ll have to look further into its storage capacity and the amount of energy it needs to function properly. This is one of the most crucial features to take a look at. If a refrigerator doesn’t offer enough temperature control, it can mean that it doesn’t offer great performance. To eventually choose the best refrigerator you’ll have to make a comparison between price and performance, plus storage space and design. The more time you put into weighing the value of these features, the more likely you are to choose the right option for you. NOTE: This post contains affiliate links and we will be compensated if you make a purchase after clicking on our links.